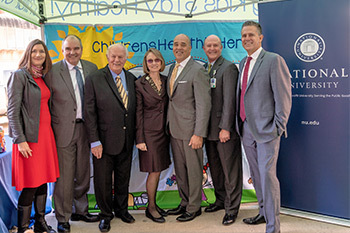 Chancellor Cunningham, NU President Dr. David Andrews, Denny Sanford with representatives from NUS, the San Diego Zoo and University Children’s Health. The beginning of a new year is invigorating. After enjoying the holidays with loved ones and celebrating the New Year, we’re at an opportune time to focus on goals. The System’s vision, "To be an educational system whose graduates are transformed and positively contribute to society," is further defined in the National University System 2020 Strategic Plan. Throughout the year, I’d like to share more about our priorities and explain the steps we’re taking toward achieving our goals as a private nonprofit educational system serving the public good. 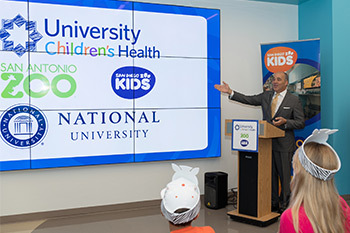 National University, the System’s flagship institution, recently sponsored the launch of the San Diego Zoo Kids channel at University Children’s Health in San Antonio, TX. We are honored to follow the extraordinary example set by our friend, renowned philanthropist T. Denny Sanford, who was the catalyst for the original development of the program. This channel, which is exclusive to medical facilities that serve pediatric patients, offers family-friendly programming that is entertaining and educational. We are thrilled to support this cause as we want to encourage children and families in the hospital to look to the future and to be lifelong learners. We are pleased to announce that in addition to the Sanford Education Programs further expanding into Texas, we will also be providing scholarships to San Antonio teachers to attend the San Diego Zoo’s Teacher Workshops in the Conservation Science Program this summer. We are proud of this sponsorship, which allows us to support healthy and strong communities and work For the Greater. Chancellor Cunningham announces sponsorship of San Diego Zoo Kids channel at University Children’s Health in San Antonio, TX. The Sanford Institute of Philanthropy, with locations at National University, John F. Kennedy University and coming soon to City University of Seattle, furthered our commitment to collaboration and community through a first-of-its-kind symposium to help increase the impact of nonprofits that offer support services to the veteran/military community and their families. As the needs of the military/veteran community grow, nonprofits are critical to supporting their needs ranging from housing, employment, counseling and medical assistance, and education. As a private, nonprofit university system, we have a strong tradition serving our military/veteran population, and this symposium was one way for us to give back and help strengthen their causes. Representatives from more than 80 nonprofit organizations including Navy Federal Credit Union and National Veterans Transition Services, Inc., came together to learn some of the Sanford Institute of Philanthropy’s Cause Selling techniques. We plan to continue to bring these kinds of groups together so that we can increase the support to those who have given so much for our country.